Not so long ago, Google felt it necessary to remove the useful Play Store feature which allowed users to see which apps you’d paid for in the past. What we’re left with, is a general summary of every app you’ve ever downloaded (even those deleted from your device), and while this is not a problem for many, the old system certainly didn’t need any alteration. Thankfully, the old system that allowed you to view only purchased apps has made a dramatic return, in the form of a third-party utility called My Purchases. Not only can you check through every single app you’ve ever purchased, but you can also see just how much you paid for each one. For those who like to keep a meticulous record of everything they buy, My Purchases is a godsend, and considering it doesn’t cost anything, is a must-download for any avid bean-counter. The fact it keeps good track of your apps is one thing, but as something of a bonus, it will also track any books or movies you’ve purchased as well – color-coded for ease of navigation. With added support for Google Accounts, you’ll also be able to ascertain which apps you’ve bought for business and which for pleasure, which is great if you’re looking to claim back through company expenses. Although the app itself is free of charge, you can pledge your support by paying $1.29 for the Pro version, which is basically the same minus the advertisements. 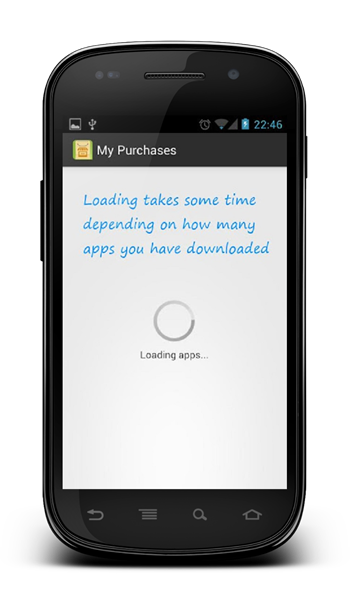 It has to be said, My Purchases’ developer Christian Arndt has manage what most good developers look to achieve – a tidy, clean app which does exactly what it says on the tin – and more. We have given it a brief run-out on an LG Nexus 4, and confirm that it works exactly as advertised and it’s a handy piece of software to have. So, if you’re curious as to how much you’re spending over at the Play Store, please give My Purchases a try by clicking on the link provided below, or browsing through the Play Store app on your Android device.